Impala Database Audit from DataSunrise is a solution for non-stop monitoring of database activity. Audit tool is very useful tool to investigate database hacks and the resulting data breaches and data loss. However, this is a tool aimed at preventing such incidents. Impala Database Audit keeps track of all database activity. In case some potentially dangerous actions are happening threatening database and data safety it immediately notifies database owners and admins giving a possibility to stop them before any harm is done. Helping compliance with such national and international sensitive data regulations as GDPR, PCI, SOX, HIPAA, etc. 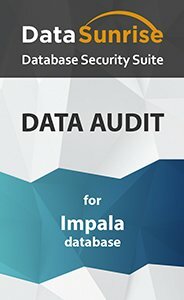 Results of Impala Database Audit can be stored anywhere or exported to external SIEM-systems which excludes any possible audit data manipulation even from database admins. To make auditing efficient, fast and user-friendly DataSunrise developed a special intelligent algorithm called Learning Rules. They create a whitelist of transaction approved, say, for employees of a company department. Whitelisting simplifies the process of query analysis and prevents false triggering of database alarm notification. Impala Database Audit is the next step for compliance with such national and international sensitive data protection regulations as GDPR, SOX, PCI, HIPAA. DataSunrise ensures comprehensive protection of Impala databases. If you’re looking for a solution to protect the integrity of your data and databases DataSunrise is the solution you’re looking for!